We all wish summer could last forever. You’re off having all your fun in the sun and then before you know it, it’s that time of the year again to switch out our bathing suits for backpacks. Don’t let the end of summer get you down! 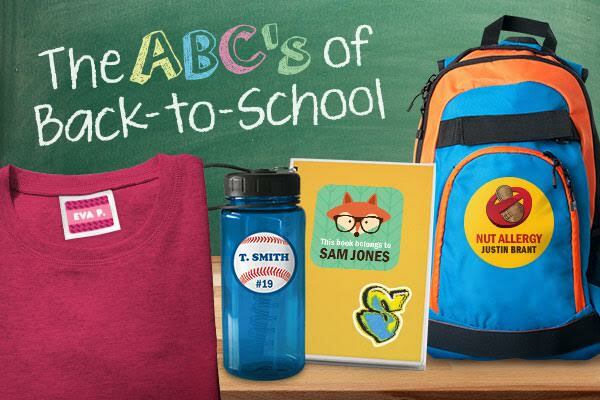 StickerYou’s ABC’s of back-to-school will help you send off your little ones to school in style with custom kids labels. With no minimum orders (yes, that means you can even order one label if you want! ), affordable pricing, and contour die-cutting technology, you can order your child’s back-to-school ID labels at any size, any shape, and any quantity through our online sticker editor platform. You and your child will even have fun customizing your labels! We promise. It’s the first day of school and your little one is so excited to show off their cool new backpack... but it turns out that someone else has the same one. Avoid the inconvenience of mixed up backpacks by customizing your child’s bag with stick-on or iron-on clothing labels. They’re super durable so they’ll withstand all the elements while your child is off on their playground adventures! 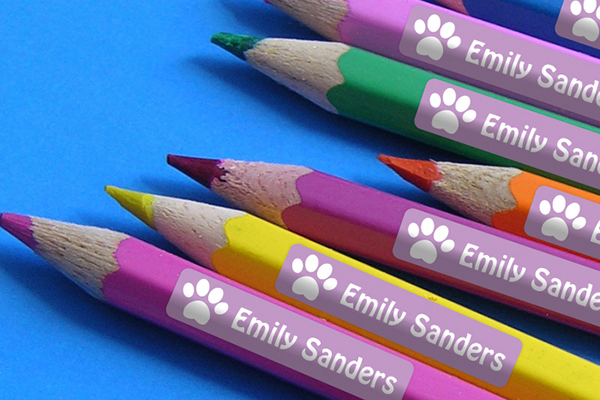 Never lose another shoe at school again with custom shoe labels. Our high-quality, glossy, and durable vinyl material has a special UV coating that will keep the label image from rubbing off from all those games of tag at recess. 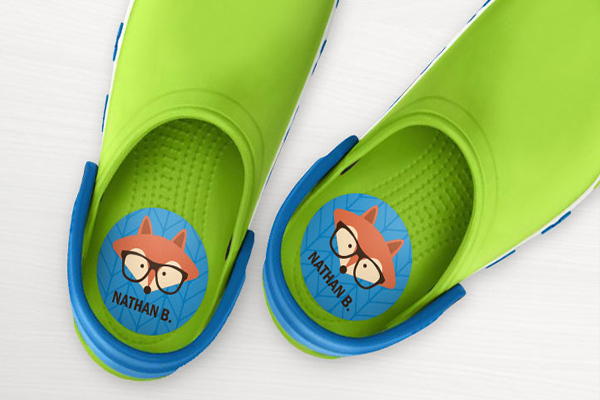 Tip: Add your child’s name in their favourite colour to the shoe label with one of our fun animal graphics for quick and easy shoe identification. 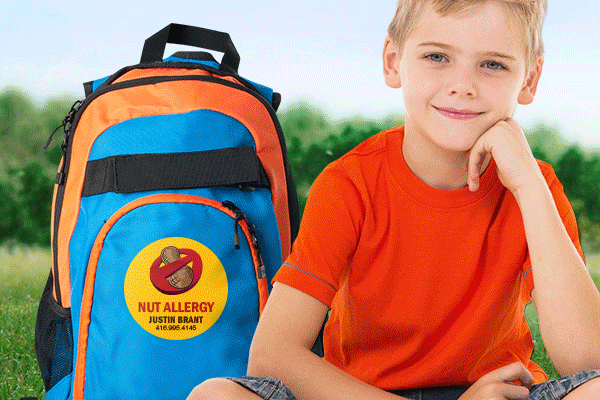 Sending your little one off to school can be unsettling if they have an allergy. Help prevent allergy attacks and give yourself some peace of mind with custom allergy labels. We have pre-made templates for common allergies such as nuts, milk, eggs, fish, wheat, dairy, and soy, but you can also customize your own labels from scratch. 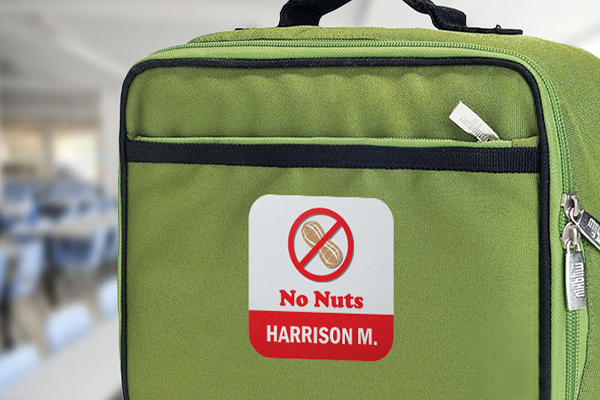 After we’ve shipped your labels right to your door, stick them onto a variety of school supply surfaces like lunchbags, backpacks or plastic containers. You can even put them in the dishwasher and trust that they’ll stick strong through wash after wash. Thanks to our special vinyl material, when you’re ready to remove them, they’ll come off clean without leaving behind a sticky residue. We know how easy it is to misplace pens and pencils at school so label them, don’t lose them! Make your writing utensils super snazzy with our strip labels template. The colour, font, and design combinations are endless so go wild and try them all out for yourself! For an awesome back-to-school promotion discount, check out our video below and enter the discount code at checkout. Have a great school year from your friends at StickerYou!